Discussion in 'POTW Collaboration' started by Serebii, Mar 17, 2019. Time for the next Pokémon of the Week and this week we have a Sinnoh Pokémon! Magnezone, the golden standard for Steel Type trapping. While others exist (Probopass, Alolan Golem), none of them pull it off quite as well as Magnezone. Additionally, its typing is rather good: Boasting a whopping 11 resistances (+ 1 immunity) is phenomenal! However, a 4x weakness to Ground and a weakness to common Fire and Fighting moves hurts. A lot. Magnezone is a Pokémon with incredible highs, but some rather significant lows that must be properly addressed if one wishes to reach victory. Idea of this set is to come in on an Steel type and strike it down with Thunderbolt or Hidden Power while it can't flee due to Magnet Pull. Thunderbolt is STAB, hits like a rail gun (or rather close), and strikes down most Steel types with impunity (Skarmory, Celesteela, Bisharp, etc.) Hidden Power Fire is the Hidden Power of choice, making quick work of Ferrothorn, (Mega) Scizor, and Kartana. Hidden Power Ground is only a consideration in regards to Heatran, who would roast Magnezone if it tried its trapping shenanigans and opposing Magnezone. Please note that a 2x super effective Hidden Power actually does slightly less than a STAB Thunderbolt, which is why Hidden Power Fighting is not getting a mention. Flash Cannon, while not good against steel types, is a potent STAB option against the Tapus (barring Fini who is slaughtered by Thunderbolt) and other Fairy types giving Magnezone a good option against them (hitting Tyranitar hard is nice too, but Assault Vest variants will still come out on top). Last move is for setting up in front of your helpless trapped victim*, enabling Magnezone to cause your opponent to rethink their counters. Substitute is great, giving Magnezone a free hit against whatever comes in next. Light Screen patches up Magnezone's shakey SDEF as well as provide utility for the rest of the team, while Barrier makes Magnezone all but unbreakable on the physical side of things. Metal Sound is an interesting option, but allows Magenzone to muscle pass any sponges that come in and think they are going to have an easy time, as well as force switches as few things would want to stay in on Magnezone after a harsh SDEF drop. *Not all trapped Steel types are helpless, other terms and restrictions apply. Please contact your Pokémon professor if you have any questions. Of course living long enough to do such a thing in front of these Steels is another matter, but you get my point. Magic Coat -bouncing Stealth Rock is fun! However, most opponents will have set Stealth Rock up when Magnezone switches in. Tapu Bulu -Tapu Bulu greatly enjoys Magnezone's anti-Steel type presence and pays the favor in turn by eliminating pesky Ground and Fighting types, reducing their Earthquake damage and providing recovery with Grassy Terrain. Tapu Koko is in a similar boat as Tapu Bulu, swapping out that anti Ground presence for a massive 50% power boost in Electric attacks with Electric terrain. Dragons like Dragonite, Latios and Latias love Magnezone, as Magnezone handily eliminates the only types that resist their STABs, allowing them to run rampant. In turn, they can pivot into any of Magnezone's weakness and take care of the attacker with their powerful STABs/coverage moves. 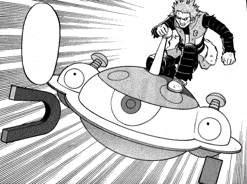 Background Information - One of Cyrus's most overwhelmingly powerful Pokemon... in the Pokemon Adventures manga anyway. Magnezone is a beloved Gen 4 favorite and cross-gen evolution of Magneton... so it's kind of surprising the anime didn't really do a lot with Magnezone with the exception of Zero from the Pokemon movie, Giratina and the Sky Warrior where we see Zero's Magnezone lead a wave of Magnetons and Magnemites in Zero's pursuit for power. However by far the most interesting take on Magnezone is as one of Cyrus's key power players. Seriously, how is this not in the games? 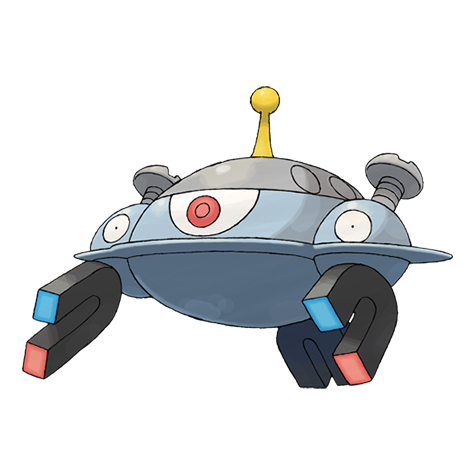 Magnezone is a magnetic Pokemon who is revolving around Cyrus, whose name means the "Sun", like a planet. We first see Cyrus's Magnzone introduced as a Magneton getting ready to evolve at Mt. Coronet which is known for it's strange magnetic properties. It's then that characters Dia (Lucas), Pearl (Barry) and Platina (Dawn) encounter Cyrus only to find out that Cyrus's skills as a trainer are on an entirely different level, Magnezone's manipulation over magnetism being particularly overwhelming that the heroes had to escape rather than battle. During his pursuit for the Solacean Ruin, we see that our heroes took pictures of him visiting the ruins which does not sit well with Cyrus, the Leader of Team Galactic ordering Magnezone to use it's ability "Magnet Pull" in order to pull the camera out of Munchlax's thick fur which is full of items thanks to it's ability "pick up". So as you can see from Cyrus, Magnezone is not only a cool Pokemon but definitely has a lot of uses if one were to ever exist in real-life. Also there's of course Magneton and Magnemite which has made plenty of appearances in the games, the Adventures manga and the anime and Magneton is for some reason Wattson's signature Pokemon over Manectric in ORAS? As you can see, the Magnezone line from Magnemite to Magnezone is a rather very overused Kanto classic for electric and steel Gym Leaders. Magnezone really hasn't changed much, suiting for often one specific playstyle but a very cool and rare playstyle nonetheless, trapping Steel-types from switching-out thanks to it's amazing and much beloved ability Magnet Pull. Other than that, I think you guys pretty much get the basic idea. STAB Thunderbolt, STAB Flash Cannon, maybe some paralyses. These are some common moves to see due to Magnezone's limited movepool, with the fourth slot being whatever you want it to be, popular choices being Hidden Power for type coverage of course, Protect to make Magnezone last longer in the battle, Volt Switch as an offensive move to switch-out and finally Magnet Rise which gives Magnezone not only ground-type immunity but also gives the user spikes, toxic spikes and sticky web immunity much like that of a flying-type which is perfect for making Magnezone last a few turns longer against a ground-type. Even as someone that doesn't play OU much, I gonna say, Focus Sash isn't good for Magnezone. Rather than taking any damage from its trapped foe, Magnezone prefers outspeeding them with the help of Choice Scarf or only takes on any Steel-type that it's not weak against. While we're at it, nobody should hold Air Balloon in OU. There's a good reason why Tapu Koko holds Shuca Berry instead of it since it lures Ground-type into attacking it rather than switching out. And formerly, reduces damage from Zygarde's Thousand Arrows since the move bypasses Air Balloon. In addition to the aforementioned Choice Scarf, Magnezone also prefers more power from Z-crystals and Choice Spec. Your talking about a set where Magnezone goes full offensive, all or nothing am I right? The problem with Focus Sash is that it's really only suited to a lead position. Hazards will break it, and it renders you unable to switch into resisted hits or you'll end up breaking your Sash. Scarf Zone was good last generation, and not much has really changed. The same set I wrote the article for last generation continues to be relevant this generation. Magnezone is deceptively fast with a Scarf; it outspeeds base 114's (which technically there are none) which let it check some things it otherwise might not be able to, such as non-Scarf Kartana, Mega Diancie, and Mega Pinsir. Magnezone's movepool may be limited, but it's worth carrying both Volt Switch and Thunderbolt because its other options really aren't that good or reliable. Volt Switch with a Scarf lets it be a speedy pivot, while Thunderbolt is good if you want to stay in and spam it, such as for late-game cleaning, so they fulfill different roles on Magnezone's set. Flash Cannon is obligatory STAB, and HP Fire is preferable to prevent Ferrothorn from totally walling it. It's worth noting that Hidden Power Ground actually doesn't 1HKO no-investment Heatran unless you run Modest. Pathfinder and shoz999 like this. Also Scarf Magneton in the lower tiers where everything would die to Magnezone. Its pretty amazing that its UU right now. But its a brilliant answer to empoleon among other things. Magnemite can run a really nice set with sturdy, berry juice and recycle, which has, if anything become even more useful thanks to Z-Moves. Or it can run a scarf with max speed and max special attack just like the evolved forms. I think Tri Attack deserves a mention, both for its decent base power and the chance to paralyze, burn or freeze. BillyBobJoe and shoz999 like this. I guess out of nostalgia but I don't think 80 base power normal move without STAB suffice enough to make Tri Attack a recommended move unless you really wanted to use it. Problem is it's generally too niche because it really doesn't offer any notable coverage or utility that another move doesn't. The Status is unreliable and may give you something you don't want (I.e., a burn on a special attacker).